Fast Writer is a free Windows 8 typing app that lets you learn ten-finger typing in a fun way. Using this app, you can challenge your typing skills. The app is basically a typing game app that will help you increase your typing speed significantly. 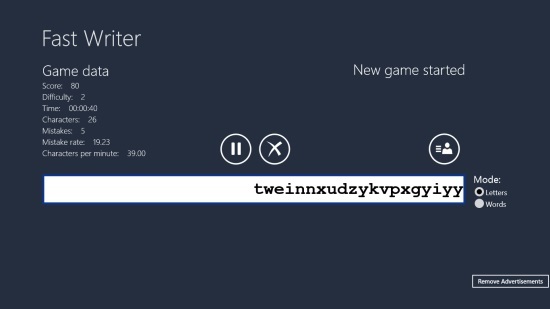 This free Windows 8 typing app is unique in its kind. It displays random letters on the screen, moving from right to left. You have to tap on the same letters on your keyboard as fast as possible. If you do not match with the speed of moving letters or type wrong letters, they will get to the left edge of the screen and you will lose the game. Your scores will be displayed on the screen. The app offers to set difficulty mode and letter display (lowercase, uppercase, and numbers) while you play. You can play game in different modes and compare your High-Scores with others. Fast Writer app is comparatively a better and faster tool to learn typing since it lets you type random letters instead of preset combinations. We generally memorize letters by words. For instance, we learn the letters T, H, and E as their combination in word ‘the’, instead of their positions on the keyboard. While typing random letters in the app, you will memorise the position of each letter on the keyboard, thus enhancing your typing speed. The app is freely available in Games category of Windows Store. You can also view it directly in Windows Store by clicking on the link given at the end. The app also offers to type words but for that you will have to buy full version of the app. To learn typing using this app, you first need to install and launch this app on your Windows 8 PC. As you get to the main screen of the app, you will find a panel in the middle of the screen on which the random letters will be displayed (first screenshot). Above this screen, icons to Play and Delete are placed. 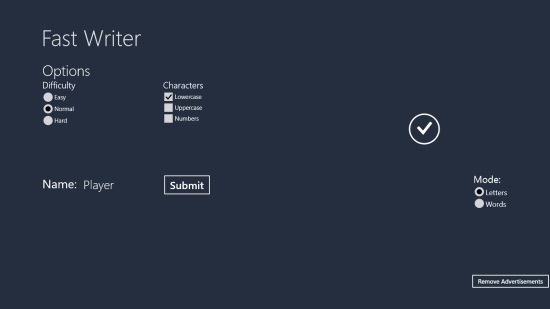 On the top right side of this panel, game data will be displayed, which will describe your score, difficulty, total time taken, number of characters typed, number of mistakes typed, mistake rate and number of characters typed per minute. On top right corner of the panel, icons for Settings and High-Scores will be located. You can click on Settings button to set your play mode. You can choose difficulty level as Easy, Normal, or Hard. You can also choose the letter display as lowercase, uppercase, or a combination of any of these. Once you set your play mode, click on right icon to start the game. You can also click on the Play button on the app’s main screen to play the game with default settings. A series of random letters will start moving from the right edge to the left edge of the screen. As you type these letters correctly in sequence, they will get disappeared from the moving series. If you type a wrong letter, it will depict on your score board. Click Submit button once the game is over to submit your scores to the High-Scores list. You can view your scores by clicking on High-Score icon placed on the top right corner of the screen panel. You can pause the game anytime in between by clicking on Stop icon above the screen panel. Click on Delete option to stop the game altogether. Option to choose from uppercase letters, lowercase letters, numbers, or a combination. 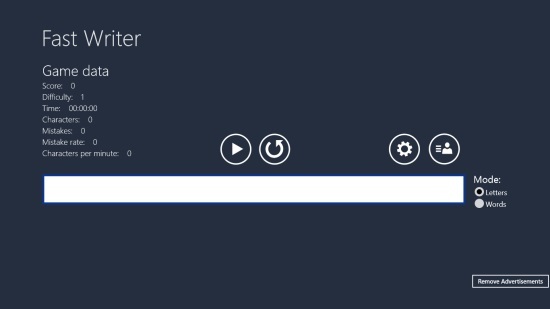 Fast Writer is a nice free Windows 8 typing game app that lets you learn typing in a unique way while having fun. By typing random letters in the app, you can enhance your typing speed and have a better grip on your keyboard. Give it a try. Do share your feedback via comments.